Our whole range of furniture takes weather resistance into account. 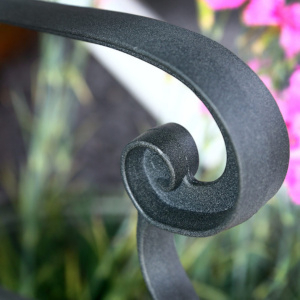 We are specialists in cast aluminium furniture, because we know the hassle involved in maintaining other materials. Wood and cast iron are prone to rot and rust respectively. Wood can also split if moisture damages it badly. If you buy patio furniture made out of these materials you have to invest both time and a bit of extra money in maintaining them. Sanding, coating in weatherproof paint, and furniture covers are mandatory to keep teak and iron furniture from deteriorating. Choosing a slate grey aluminium bench from our selection makes things easier for you. Leave it outside all year round, and it won't rust or rot. This will be the case even without any kind of maintenance. When it's bleak outside, you don't have to worry. When it's nice outside you can spend more time enjoying your garden. Scroll down this page to find the ideal slate grey bench for your garden. The Jasmine bench is a slate garden bench with a simple design that fits nicely in any garden. It has a lattice design on its backrest and seat, and curving armrests. We also have the Grace bench, with its vertical stripe backrest giving it a more contemporary look. It measures 102cm by 55cm. The Rose bench gets its name from the Rose design across the top of its backrest. 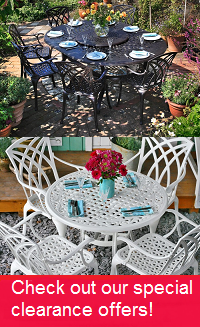 The same pattern is on the Rose chair, one of our beautiful garden chairs which can be purchased individually and also comes with the Rose bistro set. In this way, this slate grey garden bench can be paired with matching garden furniture sets to create a smart and uniform look in your garden. This white aluminium bench is 102cm by 55cm and weighs just 14kg. Since many of our customers like to add accessories when they buy their garden bench, we offer some discounts on the same page. Underneath the photo gallery are our discounted offers. Get a side table for your bench, a bistro table or another kind of garden table at 80% to 20% of its original price. Below these, select bench cushions at a phenomenal 60% off. They are made from durable acrylic, with a zipped side for easy removal and washing of the cover. The bench cushions are available in stone, terracotta, green and blue. Whichever bench you choose, we'll deliver it for free. Lazy Susan works with Geodis and Parcelforce, the latter usually dealing with deliveries of garden benches. Parcelforce offers next day delivery when an order is placed before midday, although this is not guaranteed and depends on your postcode (contact them directly for more information). They will send you a text message on the morning of delivery to let you know the one hour time slot when they will arrive. They also have a map on their website that allows you to track your delivery in real time. The friendly Lazy Susan team is available for your calls and emails from 08:00 to 18:00 every day. They can provide more details about our aluminium garden furniture and respond to any other questions you have. They can also send you fabric and metal samples. These give you an idea of our materials and help you select the right colour. Call us on 01243 717197 or email us at [email protected]. We try to answer emails within 2 hours during office hours.